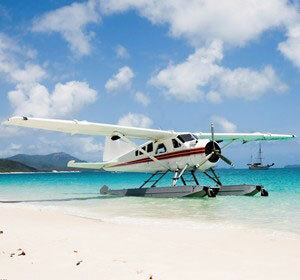 How about an Aussie version of a white Christmas on Whitehaven Beach? At Whitsunday Rent-A-Yacht we can make that dream come true. Whatever Christmas means to you, you’ll find it on a bareboat break with us. If good food is what floats your boat there’s no better place to enjoy it than the great outdoors and nothing like the sea air to whet your appetite. Every boat in our fleet has a fully equipped galley and ample refrigeration space so it’s up to you whether Christmas dinner is a seafood banquet or traditional roast. We can even help you with the provisioning of some festive fare. Just ask us when you book. For families Christmas is all about the kids and most kids love their water play! With endless beaches to explore you’ll find no shortage of activities to tire them out. Swimming, snorkelling, beach combing and beach cricket are guaranteed to be a hit, plus we have Stand Up Paddleboards (SUP’s) and kayaks available for additional hire. You can assure your little ones Santa will still find them on a bareboat. We’re told he’s pretty handy shimmying down a mast so at sea there’s definitely no chimneys required! Perhaps for you, Christmas is a time for reflection. On a bareboat charter you can take yourself to a secluded bay and enjoy tranquillity like nowhere else on earth. Immerse yourself in the beauty of nature by day and star gaze on the deck of your boat by night. A bareboat charter with us can be the ultimate in a relaxing escape. If Christmas cheer is what you’re after, grab your friends and charter one of our larger boats, or maybe a couple and sail as a ‘fleet’. Let laughter be your tonic as you celebrate good times, good cheer and look forward to a happy new year. 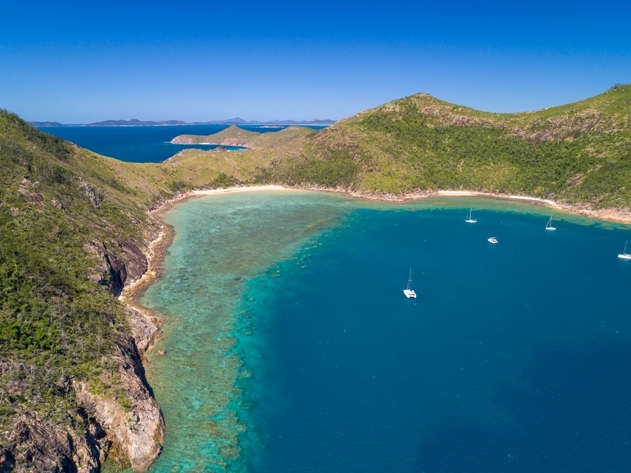 Go sailing and hiking by day, swim and explore the Whitsundays’ island paradise together, and raise a glass or three over good conversation or a board game at night. So how might a Christmas charter look? We’ve taken some of the pre-planning work off your hands with a suggested itinerary. Of course this is suggested only and would be subject to prevailing conditions. Start your holiday with a ‘sleep aboard’ in our private, tranquil base at Shute Harbour on the mainland. 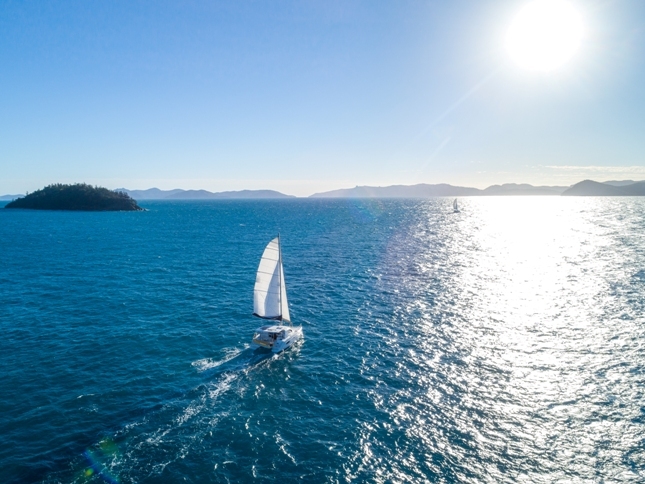 Ease into your charter after arriving in Airlie Beach by spending the day familiarising yourself with the boat, stowing the presents away out of sight and enjoying one of the most beautiful locations on the Whitsunday mainland. Begin your charter with your briefing. We’ll talk you through everything you need to know about your boat and the area you’re going to be boating in, and then you’re off. Cruise out of Shute Harbour to South Molle island where there are different anchorages to suit the wind direction, hikes to choose from and beaches to explore. 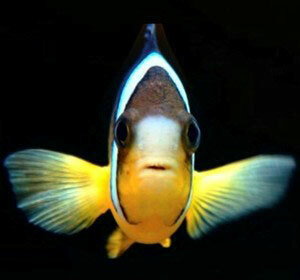 Head north on Day 2 to meet the marine life. Butterfly Bay, Maureen’s Cove, Luncheon Bay and Manta Ray Bay on Hook Island’s north coast offer premium snorkelling experiences with an array of fish. Moor up for the night at Butterfly Bay or around the corner at Stonehaven if more suited to the prevailing wind. 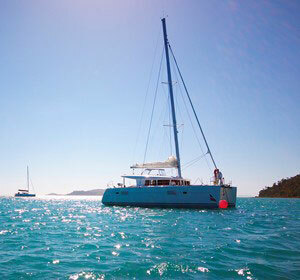 On Christmas Eve set a course for Border Island at the eastern reaches of the Whitsunday group. Snorkel the fringing reefs and sharpen your appetite for all that Christmas fare with a hike to the lookout on Border Island’s new walking track. Stay the night if the wind direction permits or make your way to the spot of your choice selected from the onboard boating ‘bible’ 100 Magic Miles. 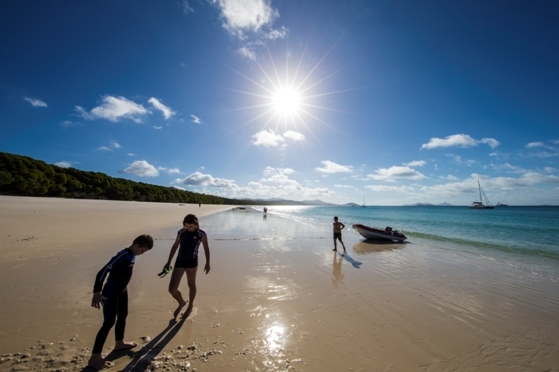 On Christmas Day set your sights for Whitehaven Beach and that quintessential ‘Aussie’ white Christmas. Enjoy a barbeque on the boat or dine on the beach with a fresh, local seafood platter from one of our provisioning companies. Get the beach cricket out, swim in the crystal seas or just walk the silica sand marvelling its purity. Take it easy on Boxing Day with a short hop across the channel to Haslewood Island and Chalkie’s Beach. Comprising the same whiter than white sand as Whitehaven it’s the perfect spot to sunbathe, read that new book and relax. 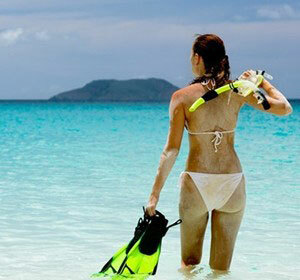 On your final full day head to Hamilton Island. We can help you book a berth in the marina where you can experience the resort lifestyle for a night and see for yourself why it’s world-renowned. With an array of restaurants to choose from this is the day to abandon the galley and spoil yourself with a meal out. Wake up refreshed on your last morning for the journey back to base. There’s no denying you’ll be sad to leave but what a Christmas you will have had! So stop dreaming of that white Christmas and let us turn your dreams into memories you’ll never forget. To book your Christmas charter in the Whitsundays contact us on 1800 075 000 today.